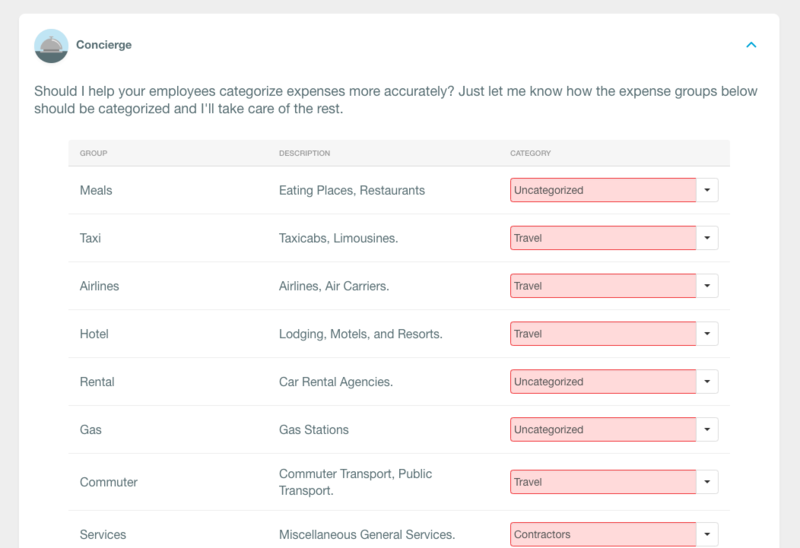 Has anyone else had expense categories disappear? I can only see the default categories on my account now and not my customer corporate categories. Does anyone know how to remedy that? The list of displayed categories and tags is dependent on the selected policy. Can you confirm that you are defaulted to the correct policy on both web and mobile? You can check this by clicking on your user icon in the top left corner or by looking for the green checkmark next to the default policy via the Policies page. Hope this helps! If you're still unable to get the correct categories showing, let us know! This has happened to me as well, in the account I have full co-pilot access on. The categories are completely deleted from the policy. How can we fix this? Hi again @rkjweb! I've just responded to your query here - I apologise for not seeing this comment quick enough. Categories will never delete themselves and there have been no changes lately that would have done so, so it's likely this might need some investigation! If you'd like to reach out, hopefully we can get to the bottom of this for you! Thanks @Ted Peeters for the quick response. I did send a message through the chat. This is for an account I co-pilot, but the owner never logs in, so I am not sure how it could have happened. In my own personal account, the policies and categories are still correct. Appreciate your quick communication. Asking me to create categories, as if I haven't been using them all along. Odd. So it's worth noting here @rkjweb that the inbox ask above is simply asking you to help map MCC categories (the things that card companies/banks send over with their transactions) to your internal categories. This means, when for instance, VISA send over a transaction it thinks are an Airline, you can map that so it automatically categorises it as Travel. The "Travel" category, along with the rest of your categories should still be listed and available within your Settings > Policies > Group > [Policy Name] > Categories settings. When you're copiloted into another users account, the categories which are available only pertain to their policies as listed from their Settings > Policies page. From what I can tell, it looks like the policies you're a member of are not the same as the policies they are. Thanks again, @Ted Peeters ... I understand what you're saying, however, I set up all of the policies, categories, etc. I am actually the only one who touches the account at all. BUT... I just realized... the owner tried connect a new Quickbooks account with Expensify yesterday, and I think QB's categories replaced ours. I think this is actually the issue. Ah! That's correct @rkjweb - you figured it out! Whenever you connect to a direct accounting integration, we'll overwrite the current categories with your direct integration's Chart of Accounts.